Just Ask D: Ready To Clean Up Your Life? Ready To Clean Up Your Life? The Clean Sweep Program is a checklist of 100 items which when completed creates complete personal freedom. These 100 items are grouped in 4 areas of life with 25 in each group: Physical Environment, Well-being, Money and Relationships and are the cornerstone for a strong and healthy life. The program helps a person clean up, restore and polish virtually every aspect of his/her life. The program will take some time to complete as you work on the balance needed to live a happy, productive life. You can print this page out or work online as you continue to update your results. The participant's goal is to get a score of 100 out of 100. The objective of the program is for the participant to get complete on about 100 possible incompletions in their life. Incompletions are those physical, emotional or mental items, which are in some way not resolved in the current moment. Incompletions of any kind drain energy. That is, they require energy to live with, given it takes work to keep us whole when there is something in the space. To have full integrity to be able to achieve your full potential is the object and the program guides you to get there in a natural way. You will have more energy and vitality. There is nothing like a clean space, full communication and self-responsibility to give you more energy. You will increase your scores just by being in the program. Once you go over the list of the 100 items, you'll find yourself handling some of these without even trying. Others take more work, but you will complete your way toward the score of 100. You will gain perspective on who you are, where you are and where you are going. When incompletions are handled, one can see what is and has been around them, including one's self. You will see situations as they really are, you'll discern what is going on with you and around you and you'll react less and choose to be more proactive in your daily life. 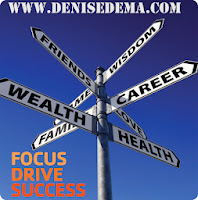 This higher perspective is essential in the process of designing one's life and it starts with the Clean Sweep Program. Answer each question. If true, check the box. Be rigorous; be a hard grader. If the statement is sometimes or usually true please DO NOT check the box until the statement is virtually always true for you. (No "credit" until it is really true!) If the statement does not apply to you, check the box. If the statement will never be true for you, check the box. (You get "credit" for it because it does not apply or will never happen.) And, you may change any statement to fit your situation better. Keep playing until all boxes are filled in. You can do it! This process may take 30 or 360 days, but you can achieve a Clean Sweep! 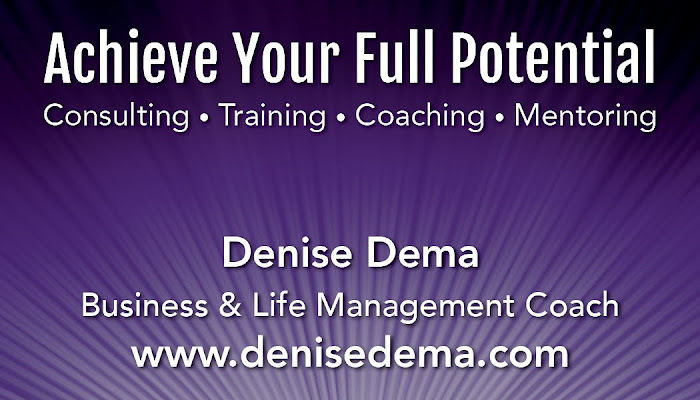 Use your coach Denise Dema to assist you. And check back once a year for maintenance. My appliances, machinery and equipment work well. (Fridge, toaster, lawn mower, water heater, etc.). I live in a house/condo that I love. I have 6 months' living expenses in an easily accessible account. There is no one whom I would dread or feel uncomfortable "bumping into". (In the street, at an airport or party). I have let go of the relationships which drag me down or damage me. ("Let go" means to end, walk away from, declare complete, no longer be attached to). I have communicated or attempted to communicate with everyone whom I have hurt, injured or seriously upset, even if it wasn't fully my fault. Scoring:Add your totals from the four sections. Initial scores for the first-time participant range, on average, between 30 - 70 points out of the 100 points possible. Most people who are "using" the program increase their scores between 2 and 6 points per month. Points are added more quickly at first, slowing down significantly after one has added 20 or so points. Major plateau areas are at 70-75, 85-90 and 95-100. Those last 5 or 10 are the ones which are most worth taking care of, given our egos are well entrenched among these incompletions. You want to take this program on with the intention of getting a 100. This program is a backdoor approach to personal growth, business success and happiness. Rather than chase goals or try to figure out one's life purpose, better to get the stuff out of the way so you can get the perspective you need to make better decisions and attract what you really want. Isn't it time to invest in the most important thing in your life? YOU! 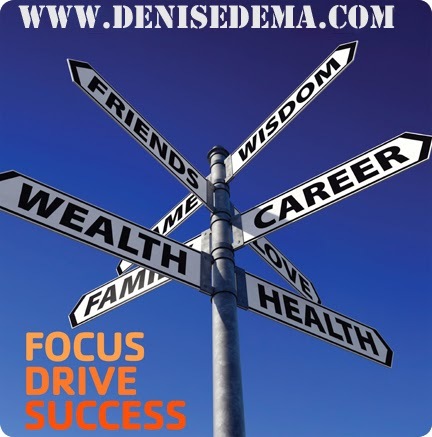 Work with a Business and Life Management Coach with over 20 years’ experience empowering people to attain self-defined success in their personal and professional life. Contact me to book a free session and start today!